I’ve been in a little bit of a 40k lull after Adepticon. I think the massive amounts of last-minute hobby work burnt me out and I have replaced some of my hobby time with other things like disc golf, board games, and even *gasp* women. Fear not, I haven’t given up 40k completely. I have been brainstorming for next years Adepticon. My little gaming group has come up with some pretty exciting ideas, all of which will rock the socks off of the judges and other hobbyists. Onto the brainstorming! The first idea that we came up with was a team consisting of Orks and Tau. The fluff behind the force would be something like the Tau were in communication with the Orks to incorporate them into the Tau Empire and the Orks being Orks only listened for a few seconds before deciding this was far too boring (read: peaceful) so they kidnapped the ethereals and are using them as hostages to black mail the Tau for equipment and support. On the hobby side of things it would be cool to make an Ork force that has tons of Tau bits mixed in with every unit. The Tau could be modeled to have less equipment because they have been forced to give it all to their “allies”. I liked this idea so much that I actually whipped up a test model. I love the Tau bits mixed into every part of the bike. 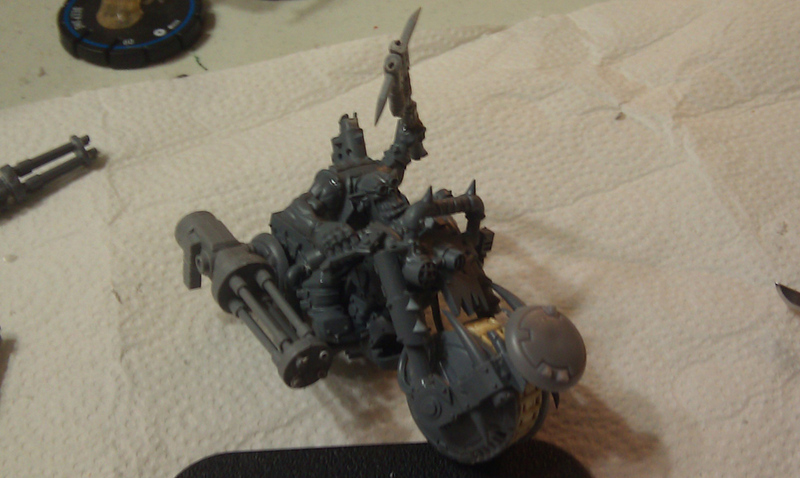 Check out both tires, the bike gun, and the rifles in the ork's hand. I have a friend (the one with the phantom titan) that has tons and tons of Eldar and he suggested that we build a force consisting of Eldar and Dark Eldar. We could use both forces to simulate Corsair Eldar which are basically Eldar that have given up the traditional ways in favor of pirating. Some of the Corsairs go so far as to seek out the Dark City and join them. From a hobby perspective it would be awesome to make pirate Eldar that might not be as well equipped and might be a little more psychotic than their Craftworld brethren. We could convert a lot of the Craftworld Eldar with some Dark Eldar bits and even include a few Dark Eldar models to show how far some of the Corsairs have gone. How cool would it be to have some sort of Chaos themed Grey Knights? From a hobby perspective I would love to chaos-ify the Grey Knights – who wouldn’t? It would be awesome to have some close combat specialists with some jagged axes, ripped off armor plates, and maybe some skulls on a chain at their waist. Or to have a Dreadknight with oozing joints, rusted metal, and some zombified driver in the cockpit. The big hurdle for me, not so much for my teammates, is that the cannon states that never in the history of the Grey Knights has a Grey Knight fallen to Chaos. To me making Grey Knights that have fallen to Chaos goes so against the fluff that you might as well make a force of Ultramarines that is being led by Marneus Calgar that allied with Ghazgul Thraka in the first Armageddon War. So I might have to make a Grey Knights successor chapter that partially fell or something like that (that’s right, the Grey Knights have successor chapters just like any other chapter, look at the Exorcists). So we will have to work on the fluff and find some sort of compromise but I actually really like this theme and I would like to make a test model in the near future. Speaking of Grey Knights I actually have a team game coming up, Khorne Daemons & Nurgle Daemons Vs. Grey Knights & Space Marines, so I can’t wait to see how that goes. I am actually pretty terrified of the Grey Knights especially because the player is building a list against the Daemons. And just to be clear, I want this to be a challenge. I look forward to games where you are both aware of the opponent you are playing and you are allowed encouraged to tailor your list. It should be a tough battle.